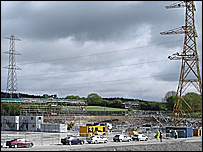 Years of uncertainty have ended over a £400m power plant outside Plymouth after Centrica finally gave it the go-ahead. Construction is to start this year on the gas-fired station at Langage on the eastern edge of the city. At least 300 jobs are expected to be created in construction and a business park is planned on 80 acres around it. The plant got planning permission six years ago, but questions about its economic viability delayed the start. The station will help stabilise UK power supplies amid predictions of shortfalls in the future. It could start commercial operations in the winter of 2008/09, providing electricity for one million homes and employing about 40 people long-term. Local councillor Sally Fairman said: "I'm relieved that the uncertainty is over. "There are so many positives to the scheme. Power supplies in the region are so fragile and we need inward investment in the area." Centrica is answering local people's concerns about the construction through a local liaison committee set up a year ago and a business hours freephone helpline, 0800 371726. Mrs Fairman said: "There are bound to be objections about the building work, but the company has made the effort to meet all comments so far and reassure people. "There will be an impact, but I hope it will be minimal. "At the end of the day I want us all to stand back and be very proud of it." 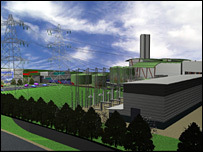 The project had been through three different owners before Centrica, which owns British Gas, gave it the go-ahead. It said the predicted shortfall in UK power supplies was a major reason for the decision to act now. Energy Minister Malcolm Wicks, said: "Langage will contribute towards the UK's security of supply as new and more efficient power stations are needed in the coming years to replace existing plants." The government's energy review, due next month, is expected to call for the building of more nuclear power stations, but getting them off the drawing board may prove a much lengthier process.